The response to the call for proposals for the IPH Open Conference was fantastic with 130 top quality abstracts being submitted. The first 24 with the most votes form the conference programme (available below). An excellent variety of public health themes will be covered including: active travel, positive ageing, promoting mental health and wellbeing, public health approaches to poverty and research, policy and practice cycle – something of interest for everyone. 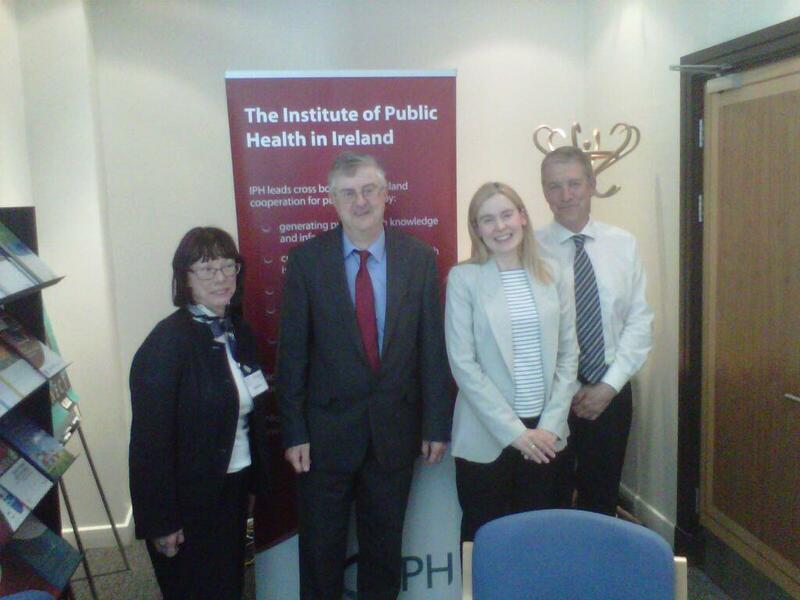 IPH welcomed Welsh Minister for Health & Social Services, Mark Drakeford, to the Dublin office in June. Topics discussed included obesity, sugar sweetened drinks and tobacco control. The Minister was visiting Dublin for a meeting of the British Irish Council Secretariat which focused on the Misuse of Substances. Left to right: Dr Elizabeth Mitchell (IPH), Mr Mark Drakeford AM Wales Minister for Health and Social Services, Dr Noelle Cotter (IPH) and Prof. Kevin Balanda (IPH). In 2009, the Council of the European Union recommended that all member countries develop a national plan for rare diseases within the framework of their health and social systems by the end of 2013. The aim is to ensure that all patients with rare disease in Europe have access to high quality care, including diagnostics, treatments and rehabilitation. Former Minister for Health, Dr. James Reilly TD launched a National Rare Disease Plan for Ireland 2014-2018 on 3 July 2014. IPH contributed through the Department of Health Steering Group overseeing the drafting of the plan and led on the development of the consultation report. IPH facilitates cooperation on alcohol policy on the island through the North South Alcohol Policy Advisory Group. A briefing paper on addressing alcohol availability developed by the group was discussed at the North South Ministerial Council meeting earlier this year. IPH are currently partnering with the Alzheimer’s Society of Ireland (ASI) to examine the potential role of prevention in reducing the burden of dementia in Irish society. It is estimated that over 40,000 people in Ireland are living with dementia with prevalence expected to treble by 2040, rising to 147,015. Evidence now clearly shows that some risk factors may be modified to protect individuals from the onset and progression of dementia. IPH and ASI will host a stakeholder seminar in late October to examine the evidence and scope potential avenues for advancing a population health approach to dementia prevention in Ireland. Contact Olga Cleary for more information. Do you know we offer free training on The Health Well website and its web-based tools? The training is a computer based classroom type session consisting of a presentation of The Health Well and its tools (Community Profiles, PANI, and Prevalence Tool) and a demonstration of its use via comprehensive case studies, to support evidence-informed policy and practice. Participants are provided with some practical work which offers a hands-on approach thereby getting the most from the training. We offer training to those working in the area of public health, such as researchers, policy practitioners, those working in health and social services and the community and voluntary sector and also the academic sector to introduce students to The Health Well. Training can be tailored to suit the needs of the participant and delivered at your place of work or study at a time and date convenient to you. To mark World Suicide Prevention Day,10 September 2014, IPH launched its Mental Health Pages on The Health Well website. These pages contain mental health resources available on the island, a theme of mental health indicators on the Community Profiles Tool and an invitation to organisations across the island to contribute their resources to these Pages. IPH is pleased to welcome the Department of Health, Social Services & Public Safety to The Health Well website's growing list of partners. It is the Department's mission 'to improve the health and social wellbeing of the people of Northern Ireland'. Documents and other materials on the Department's website are now searchable on The Health Well website alongside the other information resources it contains. IPH has submitted a first report to the CHRODIS Joint Action addressing chronic diseases and promoting healthy ageing across the life cycle, co-financed by the EU Health Programme. The objective of CHRODIS is to help EU countries and regions exchange good practices in tackling chronic conditions. IPH are an associate partner in work package 5 working on good practice in prevention of chronic conditions including cardiovascular conditions, stroke and diabetes. Other Irish partners working on CHRODIS including the Health Service Executive and the European Institute of Women’s Health. IPH is contributing to the ICARE4EU European project which aims to describe and analyse existing approaches of current integrated care programmes and new models of multidisciplinary care for people with multiple chronic conditions in 30 European countries. The total number of people with multiple chronic conditions in the European population is estimated at about 50 million. Evidence from Ireland suggests that a high proportion of the adult population are living with chronic conditions and 53.8% of the population aged 50 years and over are living with multiple chronic conditions. IPH are currently scoping innovative care approaches specifically targeting patients with multiple chronic care needs taking place in Ireland. These approaches will be shared among European partners and disseminated through the ICARE4EU project. In April 2012, a UK public consultation sought feedback from those with an interest in the policy of standardised packaging for tobacco products. The UK Government has not yet made a final decision on whether to introduce standardised packaging and undertook another consultation in 2014. The purpose of this consultation is to seek the views of interested people, businesses and organisations, with a focus on gaining any additional information relevant to standardised packaging that has arisen since the 2012 consultation. Open Access (OA) is the immediate, freely available, online access to research outputs. These outputs include peer-reviewed journal articles, conference papers and datasets of various types. The restrictions to use, commonly imposed by publisher copyright, patents or other mechanisms of control do not apply. IPH, in collaboration with the HSE Regional Library & Information Service, invite you to the fourth in a series of Open Access seminars organised as part of Annual International Open Access Week, 20- 26 October 2014: How Open Access initiatives can help deliver the 'Healthy Ireland' Programme. The theme of the Conference is 'Caring for our Children: Lessons learnt – informing future policy and practice'. The aims of the Conference are to promote high quality research, policy, and practice on children and young people’s issues and to provide opportunities for networking for all sectors working in this area. The conference agenda and speakers will be announced shortly. This multidisciplinary conference will bring together the cancer research and care communities on the island of Ireland with those from the UK, Europe and US including keynote speakers from the National Cancer Institute, USA. The conference will cover the main work streams of the AICC and will encompass a patient / charities forum as well as simultaneous sessions on quantitative biology, cancer health economics and policy and planning. The themes and topics of AICC 2015 should make the conference attractive to everybody involved across the spectrum of cancer disciplines. Copyright © 2014 Institute of Public Health in Ireland, All rights reserved.